When he looked into the one I originally wanted, he discovered that the standard open and close makers only make waffle crevices up to 3/4 of an inch thick, where a "true" Belgian has 1 inch pockets. (Only my husband!) Apparently the best ones flip upside down, using gravity to create extra deep crevices. And knowing me, he was certain it would drive me crazy to only be able to make one at a time. So...he bought me this double flip Belgian waffle maker!!! 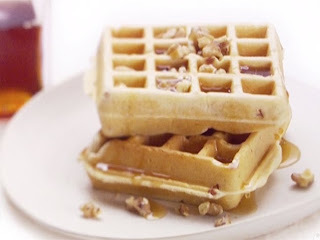 I am so excited this morning to use my new waffle maker AND try Giada's Pancetta and Cinnamon waffle recipe I've been dying to make! Bon appetite! Preheat the oven to 350 degrees F. Spread the walnuts in an even layer on a baking sheet. Bake for 10 to 12 minutes until toasted. Set aside to cool. Heat the oil in a medium skillet over medium-high heat. Add the pancetta and cook until brown and crispy, about 3 to 5 minutes. Transfer the pancetta to a paper towel-lined baking sheet to cool. In a large mixing bowl, combine waffle mix, eggs, vegetable oil, water, cinnamon, and salt. Using a whisk, blend the ingredients together until smooth. Stir in the pancetta. 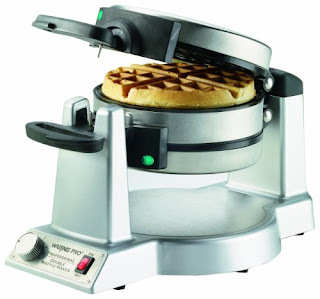 Pour the batter, using the amount recommended by the waffle iron manufacturer's instructions, into the preheated waffle iron. Cook waffles for 3 to 4 minutes until golden brown.